Will your dog likely develop Anxiety when home alone? If you suspect your dog is suffering from a form of Separation Anxiety, contact your vet, as many of the symptoms can also be medical in nature. Your vet may include a complete blood cell count, biochemistry, thyroid test, and urinalysis to gather more information on what may be causing some of your dogs behavior changes. So, what are the signs you should look for? This girl is worried, noted by the compressed body, tucked tail, scanning and stiff body. Is your dog slightly environmentally insecure or worried in new places? Does your dog hesitate when walking down some streets or new parks? Do her eyes become enlarged as she scans the area often? Maybe her body looks compressed, or she moves slower then normal with stiff leg movement. Maybe she sits and refuses to move forward, yet if you turn around, she quickly moves in the direction of home. Is your dog somewhat sound sensitive? 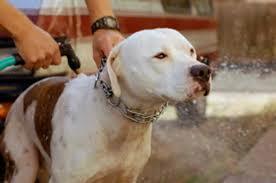 Observed by your dogs startle reflex when a truck rumbles in the distance, you drop something, or you raise your voice. 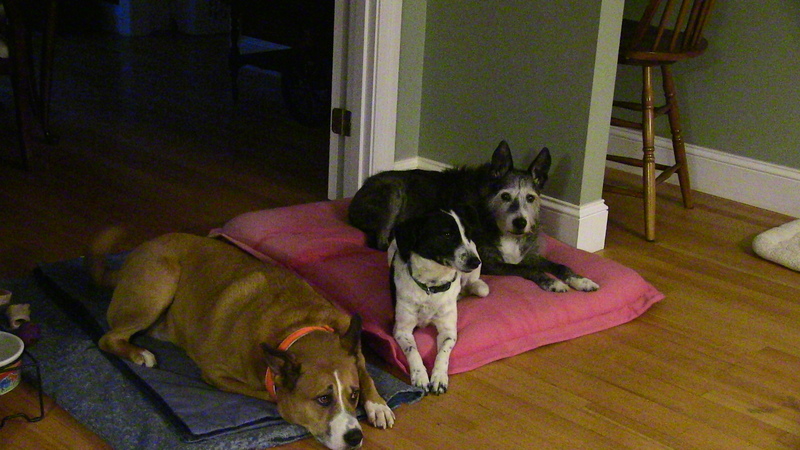 These dogs may run to another room or cower. 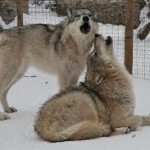 They may also become tense or lower their body and head, show the whites of their eyes and push their ears way back. Maybe you need to medicate your dog during fireworks. These dogs often go into flight mode and try to hide somewhere safe. They may stay in a state of anxiety for 30 minutes for more. Lucy is clearly insecure with this greeting, noted by her compressed, stiff, body, tucked tail, ears back, closed mouth. She is side stepping away to the right. Is your dog shy or worried about strangers? 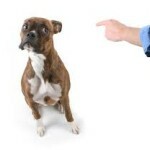 Shown by your dogs hesitation to enter guests space. Maybe your insecure dog shows his anxiety by greeting visitors in an over the top excited, jumpy wiggly or mouthy manner. Moderately fearful dogs may rush the door, barking rapidly. 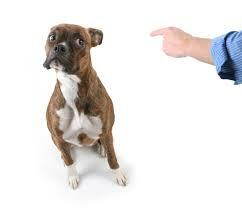 Or maybe your dog has become increasingly territorial of your home or car when people approach or are visible. If you dog is unable to calm quickly after being stressed or aroused, they are showing you that they struggle to rebound from a stressor. Separation Anxiety: Is described as a dog who is unable to cope when their human is away. 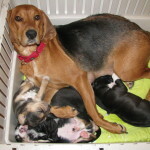 Not just anyone is able to comfort these dogs as they have bonded with one or two individuals. 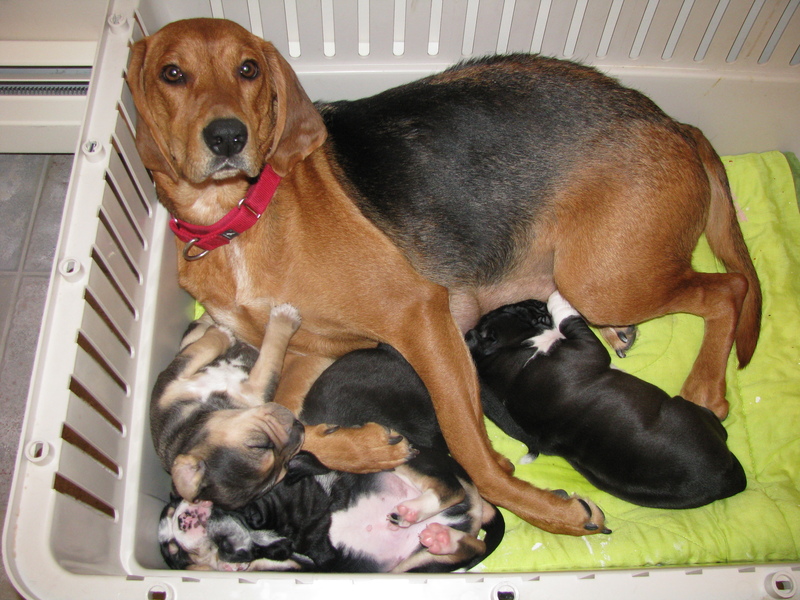 These dogs often have low environmental confidence, low sociability with new people, and are persistent in nature. Their inability to rebound keeps them in a state of anxiety longer. If the dog is vocal in nature, his anxiety may manifest with barking, if he is high energy, chewing may manifest. 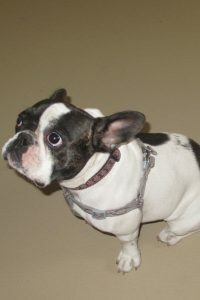 They often become extremely excited and aroused when familiar people enter the home and are often labeled velcro dogs. Isolation Stress: Is described as a dog who is fearful of being alone. Their fear of other stimuli is heightened when no one is there to make them feel safe. 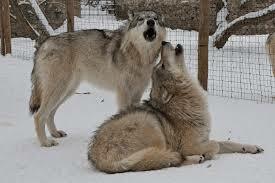 These dogs often have low environmental confidence, and may exhibit some form of sound sensitivity. 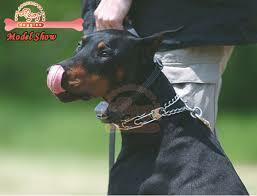 These dogs are often persistent in nature and therefore whine or pace longer then a patient dog. Vocal dogs may bark and high energy dogs may begin to chew on items nearby. Here are a few examples to give you a better picture of what may occur. Example: Max is fearful of most men and will bark or growl at them when they come too close. He is also very protective of his house and car. When alone in the home and he hears a man’s voice outside, he begins to slowly and stiffly pace about the rooms, he often drools, and will occasionally urinate in the home. This isolation stress will subside when the voices stops as his rebound time is fairly good. 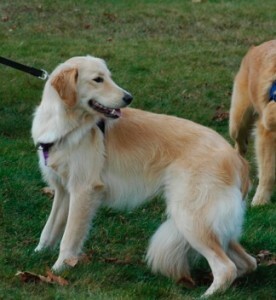 Example: Lucy is a shy pup who takes a few minutes to warm up to strangers. 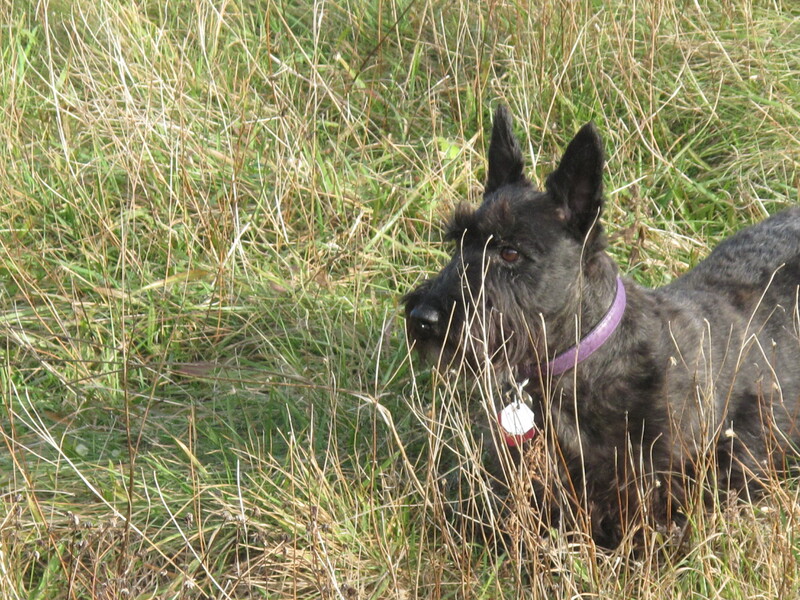 On walks, she often hesitates, scans her environment and only wants to sniff the ground near her. If she hears a siren or any medium/high pitched noise she pulls towards home. Lucy’s family has recently moved into a new home. She begins to whine when left alone for the first time, which leads to her barking, pacing and scratching at the door. When her familiar humans come home she greets them with such jumpy enthusiasm they scold her and then see the door damage and scold her even more. Lucy’s low environmental confidence and sound sensitivity have contributed to her stress and anxiety of being alone. Example: Mika is a high energy German Shepherd mix who will play fetch for an hour and will persist to find the ball when it goes into the tall grass. Mika is also verbal and barks when aroused or frustrated. When left alone, she runs and barks in the home after her owners leave for nearly 10 minutes, then chews her toys or an occasional pillow or article of clothing for 10-15 minutes and then climbs in her bed for a three hour nap. Mika is not exhibiting anxiety when alone, yet her high energy, verbal temperament and her enjoyment of chewing can mimic that of anxiety. To determine these dogs anxiety levels, we set up a camera to determine what the triggers were, how their behavior changed and if they were able to recover. A successful Behavior Modification Program will use counter conditioning and desensitization to slowly help these dogs become comfortable in their environment and cope with being alone. 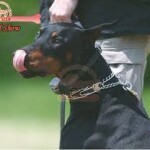 Counter conditioning is about changing the associations that the dog already has to something. 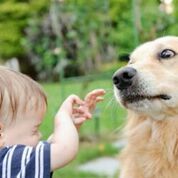 When we desensitize our dogs, we make them less sensitive to what they fear. Conditioning for this training purpose is about building their confidence and giving them the tools to feel safe when alone. Basic Plan: Disassociate each of your routine habits before you leave so your dog stays calmer. Example: If putting on your shoes is a reliable predictor for you leaving, put them on many different times a day. Pick up your keys, walk around and sit them down, without looking at your dog. You get the idea. Stop to breathe several times to help lower your dogs anxiety and aid in his resiliency. 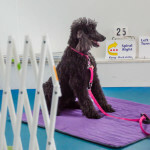 Condition: Help your dog become more confident in your home by having many short positive training sessions each day to a particular bed/mat or place. Condition your dog to go to this bed/place, using a positive approach. This is never forced or it will have a negative association and impede your goal. 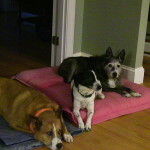 Build some duration on the mat/place by rewarding your dog often for staying on his mat while you go across the room. I never say “stay” I just let the dog learn that when he is on his mat, good things happen. Sometimes when I return I drop 10 treats on his mat to increase association. become a predictor of you leaving, and increase your dogs anxiety. 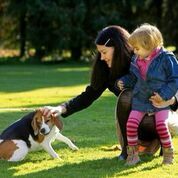 Increase your dogs daily physical and mental exercise. Teach your dog a cue, “Be good” or I’ll be back”. This gives your dog feedback, that you will be gone but will return. You can begin to teach this in small pieces while you leave your dog from one room and go to another and return, reward with calm praise. Over time you gradually increase the time you are gone and always return with calm praise. Generalizing this behavior to different rooms, the car, deck, yard, vets office and more will aid in your dogs coping skills. Add white noise to drown out noise for sensitive dogs. 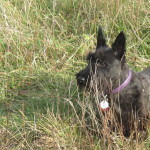 Talk to your vet about medication as it is often helpful for dogs who are environmentally worried, or sound sensitive. Summary: I hope you now have a better idea of why some dogs are predisposed to and suffer from Separation Anxiety Issues. What to look for in your dogs temperament, and some positive intervention techniques to support your dog. Always be mindful that an underlying medical condition may also be a factor. Inform your vet of your concerns, and seek a professional Dog Behavior Consultant to aid in your dogs training plan. 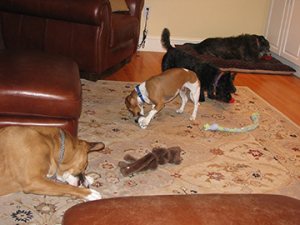 Dogs who engage in chewing when alone will benefit from a variety of toys options. Interactive toys that encourage dogs to work for their food keeps their mind engaged. Chew toys should be safe, appealing, and virtually indestructible. Many chew toys can be stuffed with dog food or healthy treats to increase their appeal. Looking at this dogs body language, the boxer is leaning away from his best friend, his ears are pinned back in fear, the whites of his eyes show the level of stress. This dog is not thinking about what he did but how he feels right now. Why does it matter how a dog feels? Because his feelings will effect his behavior. Dogs will often avoid humans who make them feel stressed or worried. In contrast, look at the body language of these two young girls, and how they are making each other feel? This is a baby sitter and a child she is responsible for. 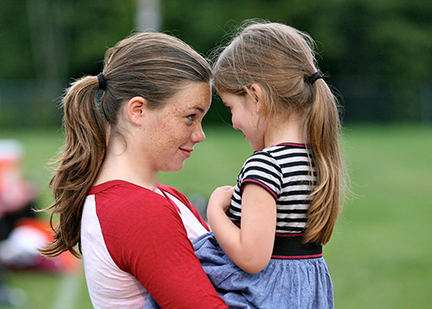 The baby sitter is building trust, mutual communication and a connection. 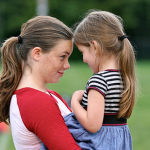 We can see a positive relationship building based on body language. 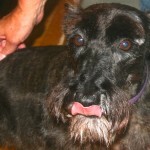 The body language of this Scottie is pretty clear how is she feels about the hand petting her. She was just groomed by the hand now petting her, do we have a trusting relationship, mutual communication and a connection? When I introduce a new rule structure to my dogs or my clients dog, I make sure good things happen when the dog performs the wanted or desired behavior. We can all agree that consequence drives behavior in all of us, but I want you to think of a consequence as a rewarding one. It is not just that I believe it works, it is scientifically proven that if a dog does a behavior and what follows is rewarding, the behavior will be repeated. This repeated behavior performed several times per day and continued over a few weeks becomes a desired habit. Is that not what we all are trying to do? Shape our dogs behavior into good habits? Below is an Example of how I make a dog feel during a training session. With a foster dog, I grab a handful of treats and lure the dog to his mat, if he sniffs it, looks at it or step on it, I say “yes” or click my clicker and drop a treat or two between his paws. Then I ask the dog to get off his mat, pick it up and walk a few steps with it in my hand. I repeat the process of laying the mat down and rewarding the dog for moving onto the mat. When he steps onto it, say “yes” and reward generously. Initially, put the mat away between sessions and play this game a few times per day. When your see your dog get excited that you are about to lay the mat down, add a cue like “go to your place” just before you lay the mat down. 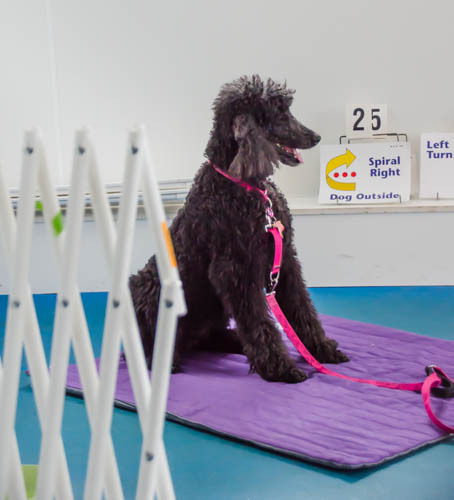 Once your dog is walking on the mat quickly, wait on the “yes” and see if your dog offers you a sit, then say “yes” and reward. Eventually your dog will offer you a down and then you can jackpot this behavior. To maintain the desired behavior of “go to your mat” I will randomly reward my dog when I see him go to his mat without being asked. Rewards can be a slow massage, stuffed yummy kong time, favorite chew bone, yummy treat, a good scratch, whatever your dog finds rewarding. I use this each morning as we enter the kitchen, each of my dogs will move towards their mat and I will eventually feed them while they are on their mat waiting patiently. I no longer ask them to go to their mat, they know going to their mat predicts they will get fed, which is rewarding to them and nice for me to have then out of the kitchen. If you are reading this Blog, then I assume you have a dog or are thinking about getting a dog. 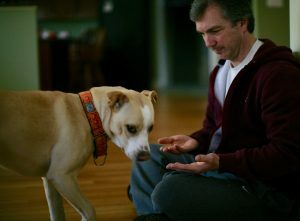 My hope is that you are a positive influence in training your dog, and not one who feels they need to “dominate” a dog. 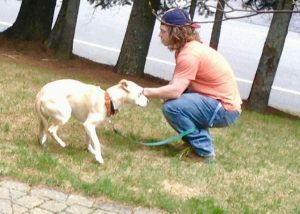 Consider how your behavior makes your dog “feel” when you are training. I hope your dog feels good when you are near, when he looks at you and when you reach to touch him. If not, read more of my blog to learn how to train your dog while also having a happy, healthy and trusting relationship. Remember, how you make a dog or friend feel, will effect the relationship. 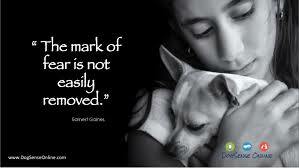 In my experiences, your dog will not remember what you say, but he will remember how you make him feel.